John Smiths Original Bitter is a popular Ale available from Tesco Groceries in 440ml to buy online. Visit Tesco Groceries for the best price for 440ml of John Smiths Original Bitter or compare prices on our other Ale products. The classic beer from John Smiths and their Original is offered as an alternative to the Extra Smooth. With a great taste of Malt and a touch of fruit this is a classic bitter that is available around the U.K. and at home ! Originally made for the factory workers in his home town this is a beer that everyone can appreciate. Enjoy ice cold. Where to buy John Smiths Original Bitter ? John Smiths Original Bitter Supermarkets & Stockists. 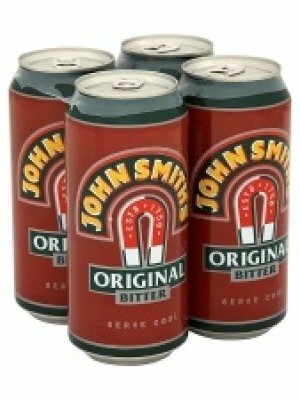 You can buy John Smiths Original Bitter online in most retailers and find it in the Ale aisle in supermarkets but we found the best deals online for John Smiths Original Bitter in Tesco Groceries, TheDrinkShop, and others. Compare the current price of John Smiths Original Bitter in 440ml size in the table of offers below. Simply click on the button to order John Smiths Original Bitter online now.